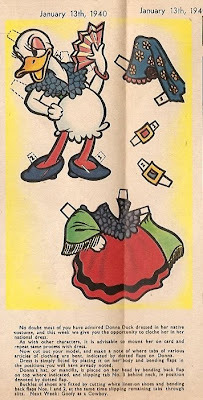 In an earlier post in this blog, I had covered the earliest appearances of Donna, the initial incarnation of Donald's girlfriend Daisy, in Britain's Mickey Mouse Weekly in 1936-37. The above scan is from the color central pages of MMW no. 206 (dated Jan. 13th, 1940).